Jim Klas recently posted this collection of photos to our Facebook page after a trip along the TMAT this fall. I must say, this set very much captures what the Trans-Minnesota Adventure Trail is all about. From the deep woods in the north, to the bogs along the Gandy Dancer, to the bluffs in the south, it’s all there. Very well done. Take a few minutes to click through and enjoy. Thanks for posting Jim! Local moto vendor news. Polaris industries has purchased a Saint Paul based map software maker. 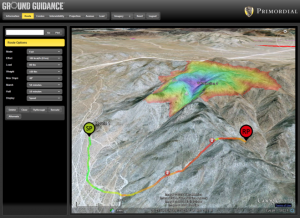 Primordial makes some extremely interesting off-road mapping and map crowd sourcing products. Polaris says it is to help bolster their mobile apps made for snowmobile riders. However, with Polaris selling a lot of ATV’s and now owning Klim as well, wouldn’t it make sense for them to take this technology and sell it into the Adventure Motorcycling market? Could we see a Klim Adventure Moto Maps mobile app sometime? I can only hope so. Take a minute and post on their Facebook page letting them know you’d like to see their Primordial software available for motorcycle riders. Let’s influence a little! Giant Loop makes some very innovative products for DS and ADV riders. They have announced even more products for 2014 at the European EICMA show. Any time they want to send me one sample of each for testing they can! Drool worthy gear. This pouch adds 2-liter easy access storage capacity to Giant Loop saddlebags and panniers — and any other secure attachment point. It is made in the U.S.A. with 18 oz. vinyl coated polyester Bomb Shell construction, beefy YKK coil zipper protected by 14 oz. vinyl coated polyester storm flap, multiple MOLLE-style webbing lash points and reflective tabs for visibility. The Possibles Pouch is named for the leather pouches carried by frontier explorers to keep critical gear, or “possibles,” in one handy location. This Buckin’ Roll Tank Bag was completely re-envisioned and redesigned for 2014, it fits virtually any motorcycle and keeps all the essentials handy and out of the way when standing on the footpegs. The Buckin’ Roll Tank Bag consists of three components, which can be used individually or in any combination: harness, center case and pannier pockets. The pannier pockets also can be added to Giant Loop’s 2014 Fandango/Diablo Tank Bags. The 2-liter center case secures to the harness with cam buckle straps. The two 2-liter Pannier Pockets attach to tank, shrouds or engine guards. The Buckin’ Roll Tank Bag is named for saddle pads used by rodeo cowboys. Giant Loop’s largest tank bag’s (8 liters) major updates focus on expandability, electronics compatibility and features driven by rider feedback. An electronics pass-through enables on-bike charging and power inside the tank bag and/or the clear vinyl map pocket top. The Fandango’s underside includes a concealed document pocket, and two separate side zippers for easy mounting to harness. Its full length interior lining with hook-and-loop accepting fabric, movable divider with elastic tire pressure gauge holder and slots, exterior mesh pocket and D-ring mounts for new optional Buckin’ Roll pannier pockets (2 liters each side) are key new features. Fuel fills are now easily accessed by simply unzipping either side from the harness, and the concave front allows vent hoses to breath. It fits virtually any motorcycle, including dirt, dual sport, adventure and sport machines with metallic or non-metallic tanks/shrouds. The Diablo Tank Bag (4 liters) updates are similar to its larger cousin, the Fandango Tank Bag, while remaining true to its minimalist, slim, trim design. An electronics pass-through enables on-bike charging and power inside the tank bag and/or the clear vinyl map pocket top. Its full interior lining with hook-and-loop accepting fabric, movable divider with elastic tire pressure gauge holder, exterior mesh pocket and D-ring mounts for new optional Buckin’ Roll pannier pockets (2 liters each side) are key new features. Fuel fills are now easily accessed by simply unzipping either side from the harness, and the concave front allows vent hoses to breath. The Diablo Tank Bag Pro fits virtually any motorcycle, including dirt, dual sport, adventure and sport machines with metallic or non-metallic tanks/shrouds. This may be old news to some, but I hadn’t heard it yet. The BMW MOA has scheduled their 2014 rally for Saint Paul July 24-27 at the State Fair grounds. Great news to have such a well marketed motorcycle event locally. Plan to go even if you don’t own a BMW. Hop on over to the BMW MOA site for more info. The jump over to our Rider Meetup site to let everyone know you are going. You are currently browsing the Minnesota Adventure Riders blog archives for November, 2013.